We're counting on the last few days of September, and before we wear our costumes for the Halloween or hit the mall for serious Christmas shopping, it is first time to prepare our mugs for Oktoberfest 2011. It is not just bars and clubs which are preparing for the grand event, but also the posh Sofitel Philippine Plaza Hotel in Manila. I missed to attend the press conference, but here's the press release that I want to share with you who would want to celebrate good beer in Sofitel (how nice it is to just get totally crazy with beer and just stay in Sofitel? No need to worry about going home safely). September 22, 2011, Manila - Bring on the beers, bratwursts and Bavarian spirit as the German Club Manila, in cooperation with Sofitel Philippine Plaza, presents the 73rd Oktoberfest Manila on October 20 to 23, 2011! The only authentic Bavarian festival in the Philippines, Oktoberfest Manila 2011 is a celebration of traditions, entertainment, and Bavarian food and beverage spreads reminiscent of classic German folk festivals, coming to vibrant life at Sofitel’s Harbor Garden Tent. In celebration of the 201st year of the Oktoberfest, the weekend’s program promises to be Manila’s most memorable yet as Sofitel’s breathtaking natural resort setting and amped-up offerings take the Oktoberfest to new heights. The Harbor Garden Tent will be decorated in the Bavarian colors, white and blue. Authentic Oktoberfest tables and benches guarantee a festive beer garden fair setting. Ladies in dirndls and gents in lederhosen strutting around the tent-turned-Oktoberfest village add to the heart-pumping Munich Oktoberfest vibe. Bavarian delights will make up the colorful culinary spread, such as fresh roasted pork knuckles, roasted calf, laugen rolls, grilled sausages and mouth-watering pastries, with refreshing, ice cold beer flowing freely for all to enjoy. The Bavarian Sound Express, well-known from previous Oktoberfests in Manila, will keep guests singing and dancing all night long. October the 23rd is Family Day, where inflatable bouncing castles, magicians, face painters and other fun games will regale young and old alike during Sunday Brunch. Oktoberfest Manila 2011 will take place from 6pm until midnight on October 20 to 22, and from 10:30am to 2pm on October 23. 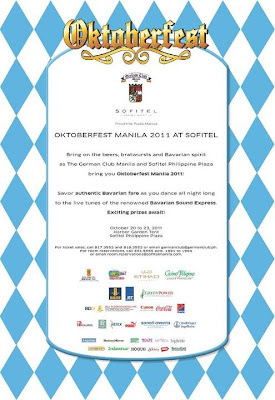 Oktoberfest Manila 2011 tickets, merchandise and goodies will be on sale at Sofitel Philippine Plaza’s grand lobby from September 22 to October 23. An authentic Bavarian food festival will be celebrated at Spiral on October 10 to 23, with a menu specially prepared by Sofitel’s Executive Chef Marko Rankel, who hails from Germany. For ticket sales, please call the German Club Manila at (632) 817.3552 and 818.3552 or email atgermanclub@germanclub.ph. For room reservations, please call (632) 551.5555 exts. 1991 to 1994 or email atroom.reservations@sofitelmanila.com. For Spiral reservations, please call (632) 832.6988 or email atfbreservations@sofitelmanila.com. All ticket inquiries has to be directed to the German Club at 817.3552 and 818.3552 or at germanclub@germanclub.ph until Oct. 6. On Oct. 7, Oktoberfest booth in the Lobby will start selling tickets from 10am to 10PM daily until Oct.23rd at 11:30am. All prices are net of taxes. Sofitel would be offering special room rates for those who are buying tickets. 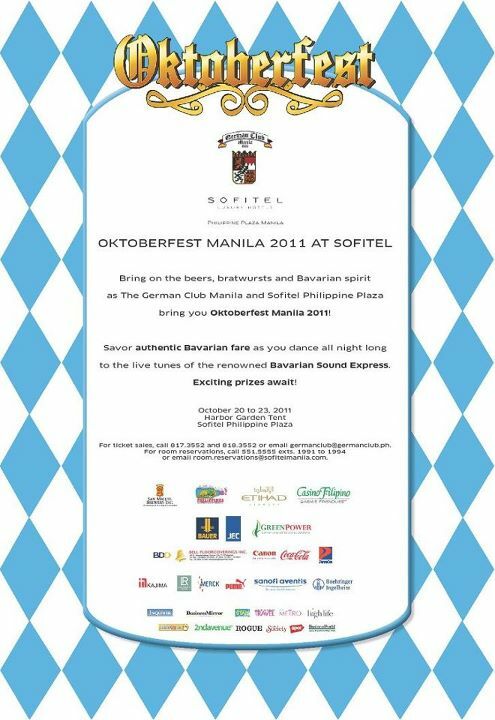 Don't forget to RSVP on the Sofitel Manila's Oktoberfest 2011 event in Facebook.